For the Canadian New Wave band, see Spoons (band). Spoon is an American rock band formed in Austin, Texas. 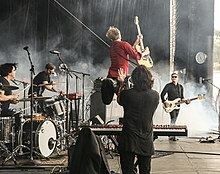 The band comprises Britt Daniel (vocals, guitar), Jim Eno (drums), Rob Pope (bass guitar, guitar, keyboards, backing vocals), and Alex Fischel (keyboard, guitar). Critics have described the band's musical style as indie rock, indie pop, art rock, and experimental rock. Formed in 1993 in Austin, Texas by Britt Daniel (vocals, guitar) and Jim Eno (drums), Spoon released their debut studio album, Telephono, in 1996. Their next full-length, A Series of Sneaks, was released in 1998 on Elektra Records. The band subsequently signed with Merge Records, where Spoon achieved greater commercial and critical prominence with the albums Girls Can Tell (2001), Kill the Moonlight (2002), Gimme Fiction (2005), Ga Ga Ga Ga Ga (2007), Transference (2010), and They Want My Soul (2014). The band's ninth album, Hot Thoughts, was released on March 17, 2017, on Matador Records. The band was formed in late 1993 by the lead singer and guitarist Britt Daniel and the drummer Jim Eno, after the two met as members of The Alien Beats. The name Spoon was chosen to honor the 1970s German avant-garde band Can, whose hit song "Spoon" was the theme song to the 1985 movie Das Messer aka Jagged Edge in the United States. Eno describes Spoon's music as "psychedelic." Spoon's first recording was the vinyl release of the EP Nefarious in May 1994. In 1995 the band signed with Matador Records, and within a year, Spoon released its first full-length LP Telephono in 1996. The album was met with mixed reviews, with critics often comparing their sound with the likes of Pavement, Pixies and Wire. But comparisons aside, Telephono showed signs of a band slipping free of its influences, mixing post-punk with a blend of pop. Less than a year later, Spoon released its second EP, Soft Effects, which served as a transition to their more distinctive, honed sound. Unlike its predecessors, Soft Effects was less noisy and brash, showcasing a more sophisticated, minimalist approach. In late 1996, Spoon was playing a gig at the Argo in Denton, Texas with Ed Cooper and local band Maxine's Radiator, which then featured Josh Zarbo on bass. Zarbo was invited to audition for Daniel and Eno in 1997, and subsequently became the band's full-time bassist until his permanent departure in 2007. After the release of Soft Effects, Spoon signed to Elektra Records in 1998. Appropriately enough, Elektra had also been the record label that found and developed the Pixies. Through Elektra the band released A Series of Sneaks in May 1998. The album did not sell as well as the label had hoped; merely four months after the release of Sneaks, Spoon's Elektra A&R man Ron Laffitte quit his job and that week the band was dropped from the label. Angry with Laffitte, who had promised to stick with the band, Spoon recorded a vindictive yet humorously-titled two-song concept single entitled "The Agony of Laffitte," which was released by Saddle Creek Records. They lamented their experience with the music business executive and questioned his motivations with the songs "The Agony of Laffitte" and "Laffitte Don't Fail Me Now". Spoon signed with the indie rock label Merge Records and released the Love Ways EP in 2000. They did this without bassist Josh Zarbo, who had briefly left the band. In 2001, Spoon released its third LP entitled Girls Can Tell. The new record was a success, selling more copies than both their previous LP releases combined. The band’s next release in 2002, Kill the Moonlight had similar success. Kill the Moonlight also contained the single, "The Way We Get By", which was popularized by its placement on the movie Stranger than Fiction (released later, in 2006) as well as the teen drama The O.C. and on the first episode of the American version of the series Shameless. Their next album, Gimme Fiction, was released in May 2005, and debuted at number 44 on the Billboard 200, selling more than 160,000 copies. Spoon’s Britt Daniel collaborated with Brian Reitzell to compose and arrange the soundtrack for the 2006 film Stranger than Fiction. The soundtrack consists chiefly of music performed by Spoon, and according to the liner notes of the official soundtrack, Brian Reitzell collaborated with Britt Daniel to compose the score, while also adapting several tracks from Kill the Moonlight and Gimme Fiction into instrumental versions of the songs. On July 10, 2007, Ga Ga Ga Ga Ga was released and debuted at number 10 on the Billboard 200. Since the release of Kill the Moonlight in 2002, Spoon has performed on late night talk shows, such as Late Show with David Letterman, Late Night with Conan O'Brien, The Late Late Show with Craig Ferguson, Last Call with Carson Daly, and The Tonight Show with Conan O'Brien as well as the PBS show Austin City Limits. They were also musical guests on Saturday Night Live on October 6, 2007, where they performed "The Underdog" and "You Got Yr. Cherry Bomb". In 2009, the review aggregator Metacritic ranked Spoon as its "Top overall artist of the decade", based on the band's consistently high review scores between 2000 and 2009, amongst other factors. On January 18, 2010, the band released its seventh studio album, Transference. It debuted at No. 4 on the Billboard 200, selling 53,000 copies in its first week. Their song "The Mystery Zone" was also chosen as the Starbucks iTunes Pick of the Week on January 26, 2010. Later that year, Spoon recorded the title track on the album See My Friends in collaboration with Ray Davies. On April 12, 2010, Spoon made a guest appearance on Conan O'Brien's The Legally Prohibited from Being Funny on Television Tour in Eugene, Oregon, where they performed the song "I Summon You" from their album Gimme Fiction. On March 17, 2017 Spoon released their ninth studio album Hot Thoughts on Matador Records, their first on the label since their 1996 debut. In April 2019, the band made the news via Democratic presidential nominee Pete Buttigieg, who was filmed playing the band's song "The Way We Get By" on piano before an event by his spokesperson, Lis Smith. The band responded by sharing the video on their Facebook and Twitter pages, remarking: "So this guy can just do anyone's job, huh." "I Turn My Camera On", from Gimme Fiction, was used in the second season of Veronica Mars, as well as on the second episode ("The Man in the S.U.V.") of Bones, and the May 4, 2008, episode of The Simpsons. "Don't Make Me a Target", "Don't You Evah" and "Got Nuffin" have been used on the TV series Chuck. Adam Buxton used the song "Don't Make Me a Target" for a segment of the pilot of his BBC Three series MeeBOX. "I Summon You", from Gimme Fiction, was used in the sixth season of Scrubs, in the episode, "My Perspective", as well as in Season 2 of Veronica Mars in the episode "Rashard and Wallace Go to White Castle". "Don't You Evah" and "I Turn My Camera On" have become popular on YouTube as dance soundtracks for the Japanese robot Keepon, accumulating over two million hits. The song "Take A Walk" from Girls Can Tell was used on the soundtrack to the popular video game Matt Hoffman's Pro BMX 2. The song "The Underdog" was used in the film Cloverfield, and included in the movie's soundtrack, Rob's Party Mix. It was also used in episode 10 of the fourth season of Numb3rs, in episode 8 of the third season of How I Met Your Mother, as well as the movies 17 Again, I Love You, Man and Horrible Bosses. Instrumentals from "The Underdog" were also used in the film Spider-Man: Homecoming. "Don't You Evah" was used on the soundtrack for the video game MLB 09: The Show. The song "The Infinite Pet" from Gimme Fiction was used in the film (500) Days of Summer "Got Nuffin" was the closing track in the season 7 finale of House. Their version of The Cramps' song "TV Set" plays over the end credits of the 2015 remake of Poltergeist. ^ "Spoon (Europe only)". ANTI. Archived from the original on 2011-09-27. Retrieved 2011-10-13. ^ "Spoon Signs to Loma Vista; Album Expected Soon". Billboard. Retrieved 2014-05-26. ^ Bob Boilen and Robin Hilton. "After Learning To Loosen Up, Spoon Readies Its Return: The All Songs Interview". NPR. Retrieved June 5, 2014. ^ "Spoon Albums From Worst To Best". Stereogum. Retrieved August 24, 2015. ^ a b "Spoon". AllMusic. Retrieved August 24, 2015. ^ "Spoon Reveal 10th Anniversary Edition of 'Gimme Fiction'". Exclaim!. Retrieved January 9, 2016. ^ "Album Review: Spoon – They Want My Soul". The Brock Press. Retrieved August 25, 2015. ^ "Spoon: a spectacle in lights". San Diego Reader. Retrieved August 25, 2015. ^ "Spoon - They Want My Soul". Uncut. Retrieved August 25, 2015. ^ "Drake Tungsten and His Boy Skellington." The Austin Chronicle, January 25, 1999. ^ Warren, Tamara. "Waxing Poetic", Anthem, Fall/Winter 2005, p. 54. ^ "Spoon. American Band Spoon. Spoon's Jim Eno in interview - Gimme Fiction". Three Monkeys Online. Retrieved 2011-10-13. ^ Hernandez, Raoul. "Drake Tungsten and His Boy Skellington." The Austin Chronicle, January 25, 1999. ^ Brian Howe, , "Pitchfork", August 1, 2006. ^ Jennifer Kelly, "Reviews: Soft Effects EP/Telephono", PopMatters, July 31, 2006. ^ Brian Howe, August 1, 2006. ^ a b Kareem Estefan, "Spoon – Artist Profile", "Stylus Magazine", September 1, 2003. ^ "Joshua Zarbo's MySpace biography". Myspace.com. Retrieved 2011-10-13. ^ Tim McMahan, "Lazy-I Interview: Spoon", The Omaha Weekly, April 18, 2001. ^ Camden Joy, "Total System Failure", The Village Voice, January 18, 2000. ^ Ken Lieck, "Dancing About Architecture," The Houston Chronicle, August 4, 2000. ^ a b Sean, "Sunday Music Spotlight – Spoon", Pop Culture Will Eat Itself , August 26, 2007. ^ Brooklyn Vegan Mike, "RIP The O.C. (& a list of EVERY song ever played)", Brooklyn Vegan, January 3, 2007. ^ Joe Gross, "In tune with Spoon", Austin 360, July 5, 2007. ^ Katie Hasty, "T.I. Holds Off Pumpkins, Interpol To Remain No. 1", Billboard, July 18, 2007. ^ SNL Archives | Detail Archived 2008-01-11 at the Wayback Machine. Retrieved October 16, 2007. ^ "The Best Music of the Decade - Metacritic". Features.metacritic.com. Retrieved 2011-10-13. ^ "Starbucks iTunes Pick of the Week - Spoon - Mystery Zone". www.mark-heringer.com. 2010-01-26. Retrieved 2011-10-13. ^ "Conan O'Brien's Tour Opens in Oregon with Self-Pleasuring Panda - Today's News: Our Take". TVGuide.com. 2010-04-13. Retrieved 2011-10-13. ^ Zoe Camp and Jeremy Gordon. "Spoon Announce New Album They Want My Soul". Pitchfork Media. Retrieved June 5, 2014. ^ Goldberg, Michael. "New Spoon Album Nearing Completion". ^ "The Daily Show" Covers Midterm Elections in Austin with "Democalypse 2014: South By South Mess" Airing Oct 27-30 at 11 p.m. ET/PT". The Futon Critic. 2014-10-22. Retrieved 2014-10-22. ^ Bloom, Madison. "Watch Pete Buttigieg Cover Spoon's "The Way We Get By" on Piano". Pitchfork. Pitchfork Media. Retrieved 17 April 2019. ^ IMDB Soundtracks for (500) Days of Summer. Retrieved August 28, 2009. This page was last edited on 17 April 2019, at 04:52 (UTC).